Well to let you all know my first blog anniversary since i started my blog & i would like to thank Mrs. AnuSriram for letting me know the features of opening the Blog.I dedicate this recipe to her, on behalf of my Blog Anniversary. This is a fusioned dish combined with a chinese spring roll with a mexican salsa. With little bit guidance from my husband with his professional touch of salsa i made it happen & the presentation. Heat oil in a pan. Add in the Chopped ginger & garlic followed by the rest of the vegetables & mix it well. Do not overcook the vegetable as it has to be a little bit crunchy. Once the vegetables are half done as in the seasoning, soy sauce & sweat the veg in the mix. do not add too much sauce as the mix will get soggy & will tear the wrap while frying. Allow it to cool down by keeping it separate. Spread the wrapper in a clean workplace & place one on top of other. place the mix in the centre & wrap up the corners to get a cylinder shape. Heat oil in a pan & deep fry until golden brown.serve hot with Sweet & sour salsa or tomato ketchup. Heat a little bit oil in a pan. Add the vinegar & tomato ketchup with little bit chopped ginger & garlic. Once it starts to get boiling add in the cornstarch to thincken the mix. In a clean bowl add all the chopped vegetables & pour in the sweet & sour mix on top garnished with cilantro. Allow it to cool down before you serve as a cold salsa is a good combination for a hot spring roll. Thats lovely! Thank you so much for the treat! Congratulations on your Blog's first Anniversary and many more to come.. Rock! Congratulations! Wish and hope fpr many more. Sripriya i just saw the recipe in foodnetwork a fewdays back..since then i have been looking for springroll wrappers......i just couldnt find them in any frozen/flour section.....did u buy in some chinese grocery???? Congrats dear!! spring rolls look delicious. Congratulations on your blog anniversary! These spring rolls sound amazing, long list of ingredients, but I'm sure well worth it! Congrats ! Wish many more years of happy blogging.... Very well presented the egg roll! wow spring roll, its a long time we ate this. Looking deliicous. 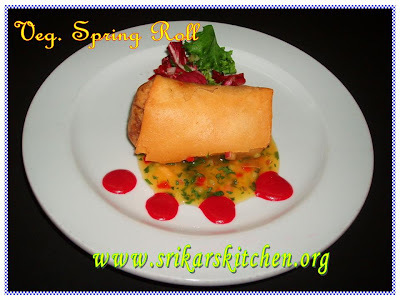 congrats on completing one year of blogging..spring rolls looks great..
Wow yummy spring rolls. Lovely presentation. Congrats on your 1st blog anniversary. Spring rolls looks prefect n delicious...Congrats for ur first blog anniversary...lovely presentation...Keep on rocking dear!! Happy blog anniversary. Congratulations and celebrations. You rock baby! Congrats dear... spring roll looks inviting and perfect. i have a surprise for u. The right time i have come here to tell u......visit my blog. I love spring tolls and this looks so crispy and delicious. spring rolls look real yumm .. Happy Blog Anniversary Sripriya ..